Soma Records – new Funk D’Void and Deepchord – Chain D.L.K. The fifth EP from Soma’s 20th Anniversary series provides three incredibly different reworks of the classic Funk D’Void track, Diabla. To date Diabla is one of Soma’s biggest tracks. Back in 2001 it was caned by everyone from Laurent Garnier to Dave Clarke to Pete Tong, and was the archetypal closing track in so many DJ sets. Whatever the case, it is a true representation of Techno from the turn of the century, and an undeniable classic. At the time it was reworked by The Hacker, Samuel L Session, Kevin Saunderson, Octave One, and of course, a certain Heavenly rework by the man himself. 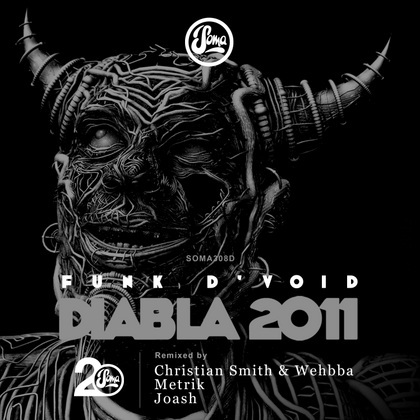 In 2011 we revisit Diabla with Christian Smith and Wehbba, Metrik and Joash who provide 3 very different, but equally brilliant remixes. Deepchord – Hash-bar Remnants Pt 1! Having steadily developed his sound over the course of the past 25 years, Deepchord’s (Rod Modell) intricate constructions and engrossing aural explorations have established him as a potent force in music production. It goes without saying that we are hugely honoured to have him on board at such a special time in the label’s history. As a prelude to his highly anticipated Soma debut LP, Hash-Bar Loops, scheduled for release in early July, we present you with Amsterdam Remnants – an epic two track EP of what remains from his extended sojourn in the city. Whilst both tracks on the EP are not featured on the album itself, they retain the characteristic warmth, depth and stunning atmosphere of what lies therein. First track Amsterdam Remnant 1 mixes up a spiralling blend of synthetic, layered harmonics, cloaking a deep, rhythmic percussive vibe. The depth of sound is truly staggering; subtle interference with underlying frequencies generates an entrancing experience which perfectly demonstrates the masterful control Modell is renowned for. Amsterdam Remnant 2 swells and shimmers with the sound of rushing waves, held together by a solid, low frequency bass beat which rumbles and repeats. Descending sound patterns slowly rise from their filtered state into hypnotic, whirling beauty, striking a perfect balance of ambient luxury and lo-fi techno. After completion of this material, Modell decided to ceremoniously give up the master cut to the murky depths of an Amsterdam canal as an act of gratitude to the city – “giving back to the place that inspired the music” – a self-effacing and sentimental gesture which perfectly reflects the deep thought and careful consideration put into this release. We can’t wait to let you hear it.